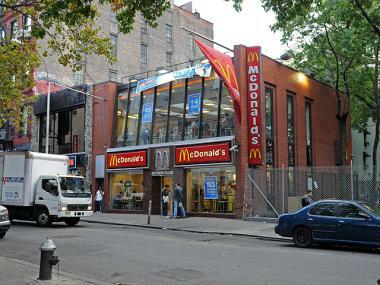 The McDonald's on West 3rd Street near Sixth Avenue in Greenwich Village was the site of a brutal attack Oct. 13, 2011. MANHATTAN — Management of the Greenwich Village McDonald's where a worker beat two female customers who jumped over the counter early Thursday chose not to hire off-duty NYPD officers to patrol the restaurant, police sources said. "This particular McDonald's was approached in the past about hiring uniformed, off-duty NYPD security because of the frequent problems there," a police source said. "They apparently decided it wasn't in their financial interest." McDonald's did not respond to inquiries about security at its 136 W. 3rd St. location, where the incident occurred. A McDonald's spokeswoman said an investigation is ongoing. McDonald's staffer Rayon McIntosh, 31, allegedly used a metal rod to beat customers Denise Darbeau, 24, of Queens, and her pal, Rachel Edwards, 24, of Brooklyn after the duo jumped the counter during a fight over their burger order. The attack was caught on cellphone camera. McIntosh was charged with felony assault and criminal possession of a weapon and is due back in court Oct. 18. The women were charged with misdemeanor trespass. Still, local leaders said the NYPD's 6th Precinct should put more officers on the streets of the Village. "I wish the precinct had a better police presence in the whole Village," said Robert Ziegler, owner of the Christopher Street bar Boots & Saddle who has started a community safety group called the West Village Coalition. "We need it badly." Ziegler said he doesn't walk around Sixth Avenue at night because of crime in the area. "I thought Christopher Street was bad, but I think it's worse over there," he said. Peter Rockwitz, another West Village Coalition coordinator, said that while he would like to see more officers in the area, he realizes the precinct has limitations. "You want to know that you can feel safe walking into any business, but the cops can't be everywhere," he said. Another brutal attack occurred at the West 3rd Street McDonald's just a few months ago. Aspiring model and Pink Tea Cup employee Damian Furtch, 26, was beaten by two men in what was initially described as an anti-gay attack as he left the restaurant on March 27. One of Furtch's alleged attackers, 21-year-old homeless man Anthony Bray, pleaded guilty to misdemeanor assault and was sentenced to six months in jail, court records show. Christopher Street Patrol president Dave Poster said the recent McDonald's attack, which left one woman with a fractured skull and broken arm, indicated the need for additional policing in the Village and is representative of long-standing disorder. "This is exactly what's been happening all over the Village. It's what happened at Dunkin' Donuts [in a May incident], it's what's happening on [Pier 45]. It's just another example of people who are coming to the Village and getting out-of-control," he said. "There's always a mob out there [in front of McDonald's]," said Vincent Fazio, 27, who works across the street from the West 3rd Street eatery. "They start fights with people coming out of the bars"
Fazio said he saw a man who was standing outside the eatery about two weeks ago throw a bottle at a cab, breaking its back window. "People who live around here stay away from it at night," he said. A bar bouncer, who was so fearful of recrimination he asked that his name not be used or the bar he works at identified, said the McDonald's has a lot of "fights and assaults." "It's surprising it stays open," he said. "One of my employees got beat up there." He said a group of men attacked his colleague after he took too long to place his order. "They didn't want to wait to get their food," he said. He added that he felt much of the trouble was caused by groups of young people that hang out on Christopher Street. But he added that he considered early Thursday's attack "overkill." "It's just a girl and he hit her with a rod," he said. UPDATE: A previous version of this story said Rayon McIntosh was a cashier at the McDonald's, but he worked as a cook.